Medium-size black holes actually do exist, according to the latest findings from NASA's Hubble Space Telescope, but scientists had to look in some unexpected places to find them. The previously undiscovered black holes provide an important link that sheds light on the way black holes grow. Even more odd, these new black holes were found in the cores of glittering, "beehive" swarms of stars -- called globular star clusters -- that orbit our Milky Way and other galaxies. The new findings promise a better understanding of how galaxies and globular clusters first formed billions of years ago. 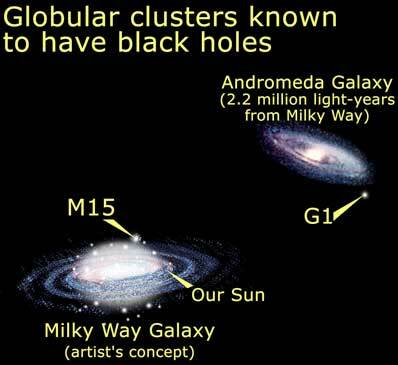 Globular star clusters contain the oldest stars in the universe. If globulars have black holes now, then globulars most likely had black holes when they originally formed. The new results indicate that the very sedate, elderly environments of globular clusters house these exotic objects, quite unlike the violent cores of some galaxies. "These findings may be telling us something very deep about the formation of star clusters and black holes in the early universe," said Roeland Van Der Marel of the Space Telescope Science Institute in Baltimore. 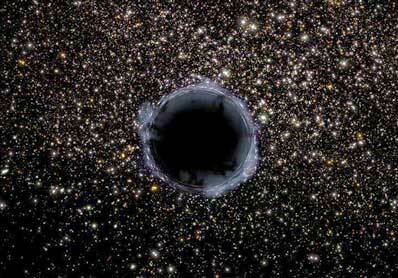 "Black holes are even more common in the universe than previously thought." "Not only will we learn about the formation of the black holes, but these new data from Hubble help us connect globular clusters to galaxies, providing information on one of the most important unsolved problems in astronomy today: how galaxy structure forms in the universe," added Michael Rich of the University of California, Los Angeles. This is reinforced by the uncanny fact found by these investigations that a black hole's mass is proportional to the mass of the stellar environment it inhabits. 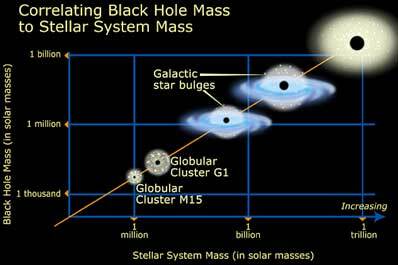 Supermassive black holes found by Hubble in the centers of galaxies represent about 0.5 percent of the galaxies' mass. Amazingly, the black holes now found in star clusters, which are 10,000 times less massive than a galaxy, also obey this trend. It appears that there is some yet-to-be-discovered underlying process that ties a black hole to its host in a fundamental way. Nature is providing a big clue as to how these systems and their black holes form. "The intermediate-mass black holes that have now been found with Hubble may be the building blocks of the supermassive black holes that dwell in the centers of most galaxies," said Karl Gebhardt of the University of Texas at Austin. Van Der Marel led a team that uncovered a black hole in the center of the globular star cluster M15, 32,000 light-years away in the constellation Pegasus. His collaborator Joris Gerssen, also of the Space Telescope Science Institute, pinned down the black hole's mass at 4,000 times that of our Sun. In a separate observing program, a team led by Rich, and including Gebhardt and Luis Ho of the Carnegie Institution of Washington, found a 20,000-solar-mass black hole in the giant globular cluster G1, located 70 times farther -- 2.2 million light-years away -- in the neighboring Andromeda galaxy. By contrast, stellar-mass black holes are only a few times the mass of our Sun, and galactic-center black holes can be millions or billions of times more massive than our Sun. Previously, X-ray observations from the ROSAT Observatory and NASA's Chandra Observatory have identified ultra-bright X-ray sources that could also be interpreted as intermediate-mass black holes in star-forming galaxies. However, alternative interpretations for these X-ray sources continue to exist. By contrast, Hubble's measurements are based on the velocities of stars whirling around in the dense cores of globular clusters, which yield a direct measurement of the black hole masses. 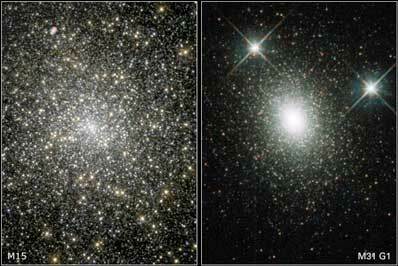 The M15 globular star cluster is close enough that individual star speeds can be measured. By contrast, the G1 observations rely on measurements of the collective properties of many stars. In either case, a black hole can be identified by using a common Hubble black-hole-hunting technique. Stars close to the black-hole "whirlpool" orbit at a faster rate. 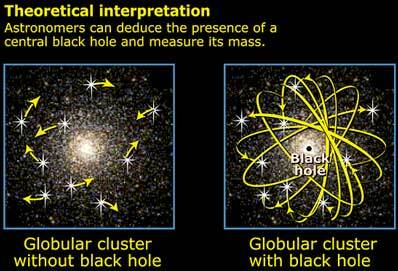 Astronomers have searched for black holes in globular clusters for nearly 30 years. The roadblock has been the fact that ground-based telescopes cannot easily resolve the stars closest to the suspected black hole. As far back as the 1970s, hunting for globular-cluster black holes was recognized as a task suited for Hubble Space Telescope's exquisite resolution, which is needed for looking close to a black hole.